Tonkatsu King is located on the first level of Orchid Hotel, a three minute walking distance from Tanjong Pagar MRT. One can easily spot this small size Japanese shop with the big portrait banners on the outside, and the never ending queue outside the shop. I have heard about this ramen place for quite a while now and wanted to try it, but the queue always had me think twice. While queuing for your table, either get the order chit from the trolley by the queue or if they staff is free, they will hand it to you. You can choose the normal Tonkotsu Ramen, Black Spicy Tonkotsu Ramen or the Red Spicy Tonkotsu Ramen, each type with plain or three choices of toppings. The waiting time was not as long as I thought it would be. I think we managed to get seated within half an hour. Time was passed quickly as we studied the order chit for a decision. We were seated in a corner, and a rough count, this shop can sit about 24 customers. Quite a small shop. It's really and eat and go kind of place, and that's why the queue was long, but the turnover was quite fast. 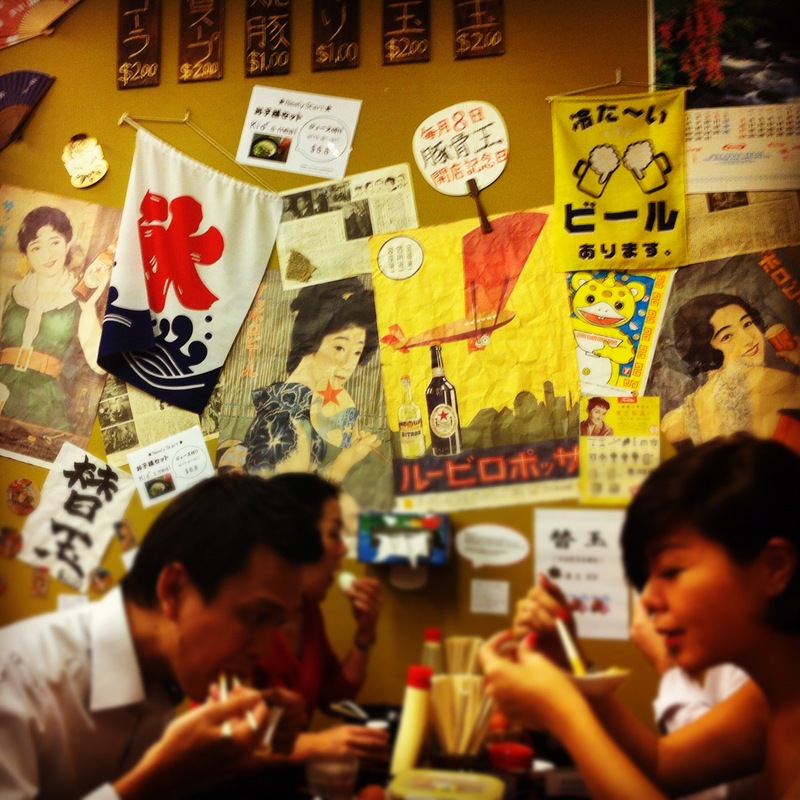 The wall was decorated with alot of Japanese banners and pictures. There are some side orders on the wall too. But they were in Japanese. I can't read Japanese, but my two friends managed to figure out most of them. If you need additional noodles, you can top up a $2.00 but remember to leave some soup, as the noodles are served dry. Without soup. 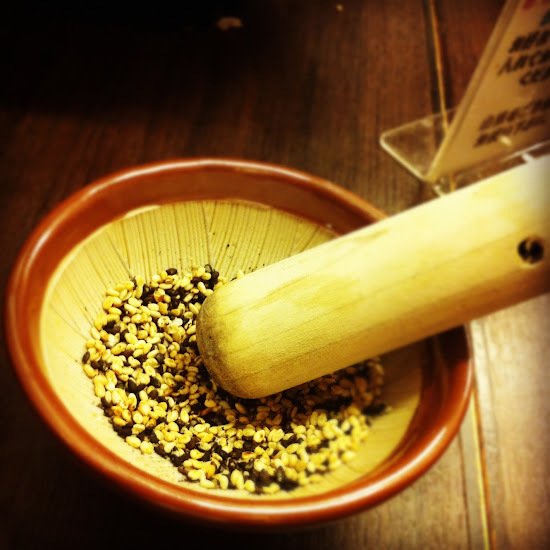 The waitress placed a bowl of sesame for each of us. 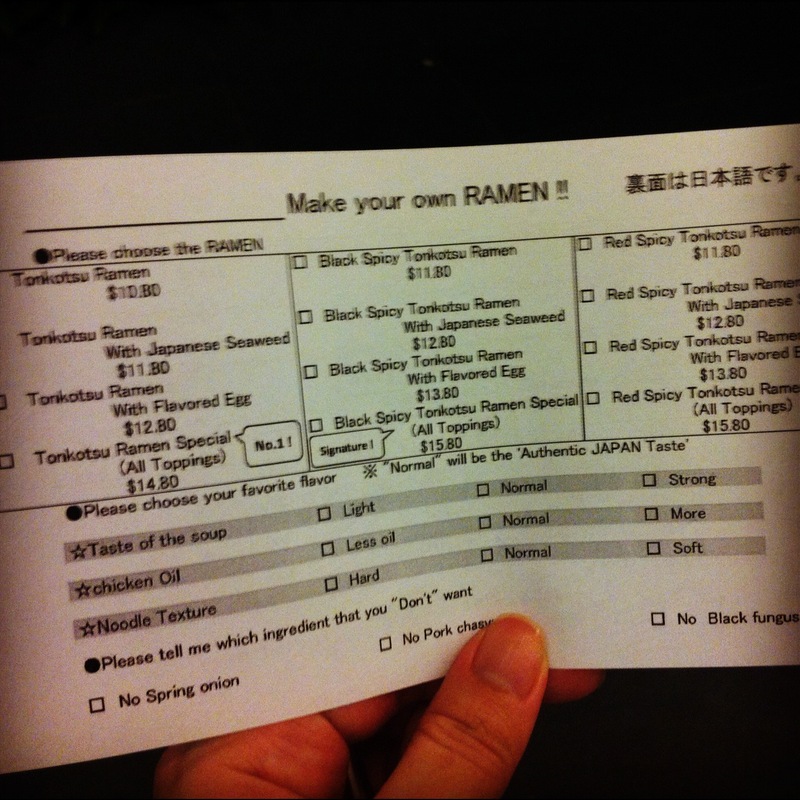 There is a piece of A4 paper on the wall with the instructions on how to have a tastier ramen with the sesame. We would need to grind the sesame before adding the preferred amount into the ramen. My friends just pour them in without grinding. 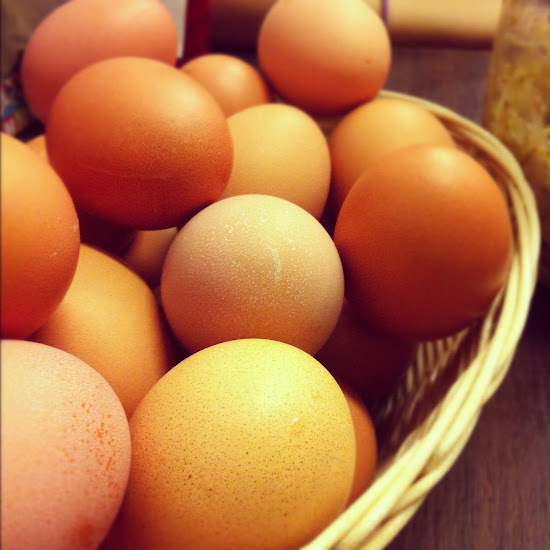 On each table, there is a basket of hardboiled eggs and a container of marinated beansprouts. These are "freeflow" for us to eat. The beansprouts taste nice. The Tonkotsu Ramen with all toppings, consist of one seaweed, one flavoured egg and two pieces of charsiew. 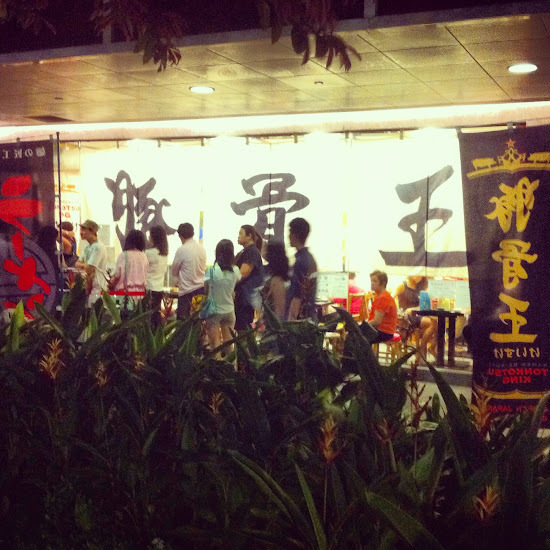 The charsiew was the nicest I have eaten among the many ramen places. It does not have that weird taste the others have. Comments were that two pieces of charsiew too much to finish. Overall, our ramen taste nice. We all can't take spicy, so we chose the normal Tonkotsu Ramen, with our preferred toppings of course. I had finish up my ramen, with little soup left in the bowl. 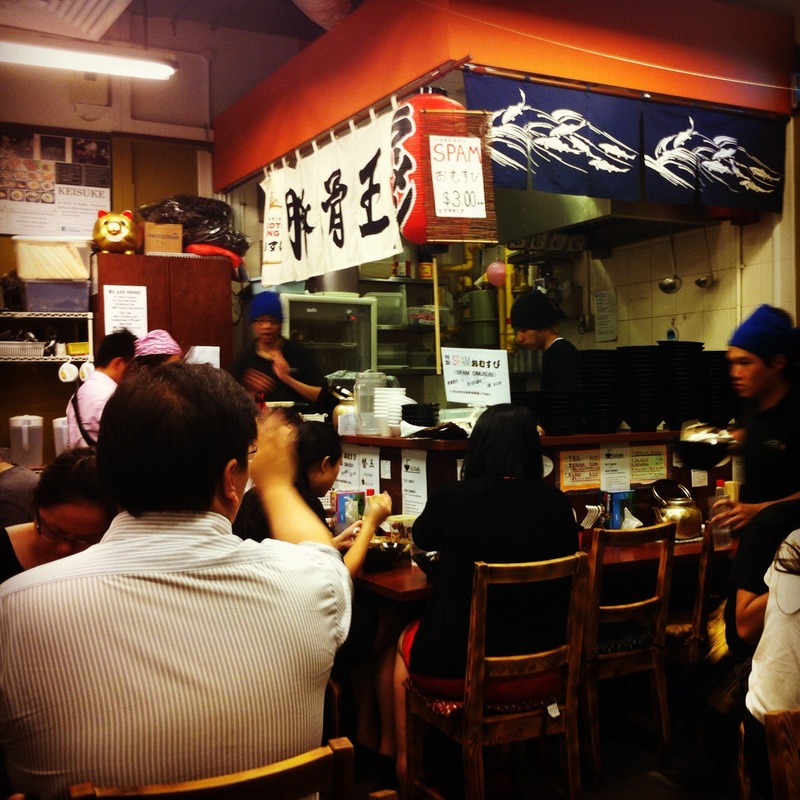 And I was sweating from the heat of the hot yummy ramen and the hot air from the kitchen circulating in the small shop space. Leaving the place, there was still a queue to get a bowl of the ramen. 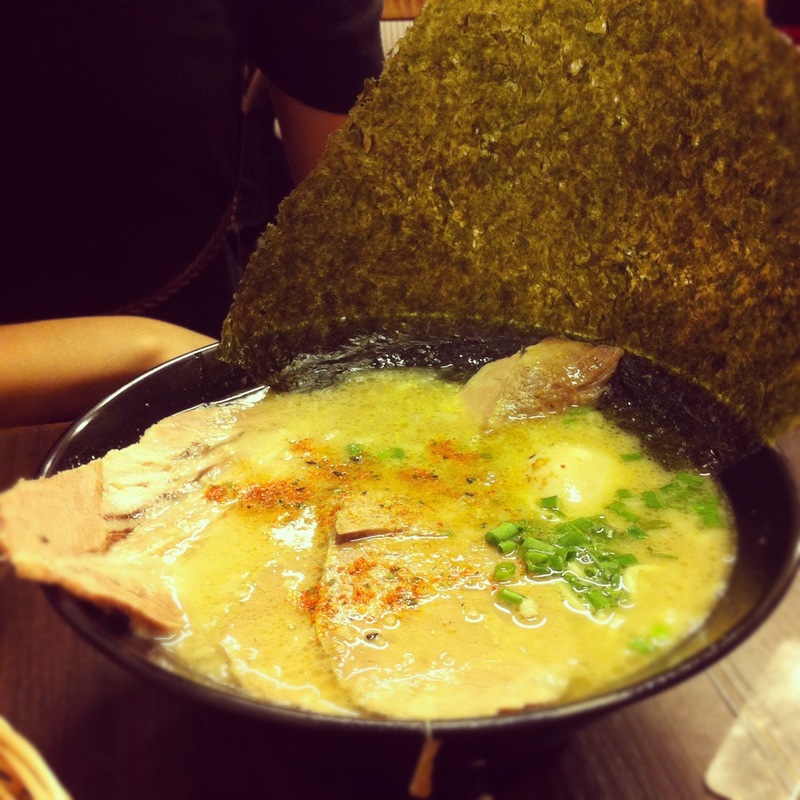 I would definitely come back again for the delicious ramen.